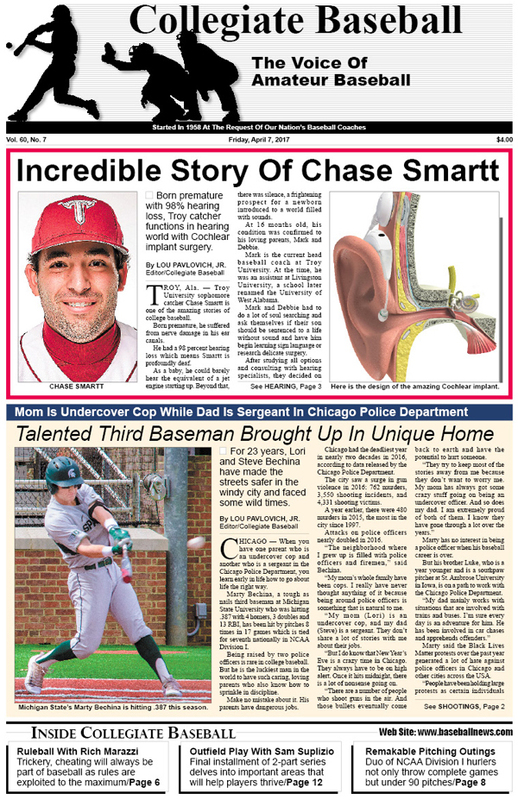 • Amazing Story: Chase Smartt born premature with 98 percent hearing loss but now hears with Cochlear implant. • Incredible Family: Michigan State’s Marty Bechina was raised by a mom who is an undercover cop and dad who is a sergeant in the Chicago Police Department. • Strikes Out 20: JP Sears of The Citadel has an amazing outing on the mound against VMI. • Genesis Of Weighted Ball Training: Believe it or not, this type of training had its humble beginnings in 1963. • Editorial: Speed up game with full strike zone calls to move contests along. • Charlie Greene: Positioning of pivot foot crucial for safe throwing. • Ruleball With Rich Marazzi: Fine line exists between trickery, illegal activity. • Junior College Notes: Hunter Stratton fires 2 consecutive no-hitters for Walters State, plus much more. • Collegiate Baseball’s NCAA Division I Poll Presented By Big League Chew: Oregon St. No. 1 with 20-1 record and 15 straight wins. • Collegiate Baseball’s National Players of The Week: RHP Cory Abbott of Loyola Marymount fires first perfect game in school history among 8 National Players of The Week. • NCAA Division I Notes: Two pitchers fire 9-inning complete games under 90 pitches among a host of other notes. • NCAA Division 2 Notes: Proud Armstrong St. program will be terminated, plus much more. • Special Report: Teaching precision outfield play with Sam Suplizio, considered the best outfield coach in history. • NCAA Division 3 Notes: Field at Southern Maine will be named after legendary Ed Flaherty. • NAIA Notes: Jeff Sikes of Warner University celebrates his 1,000th coaching victory, plus much more. • Don Keathley: Culture of elitism in baseball has another option in amateur game. • Collegiate Baseball’s National High School Top 30: Archbishop McCarthy No. 1 with 11-0 record. • High School Notes: Stacy Hester of Brandon H.S. and Rick Carpenter of Prosper H.S. each pick up 800th coaching wins in storied careers, plus much more. To purchase the April 7, 2017 edition of Collegiate Baseball or subscribe, CLICK HERE.